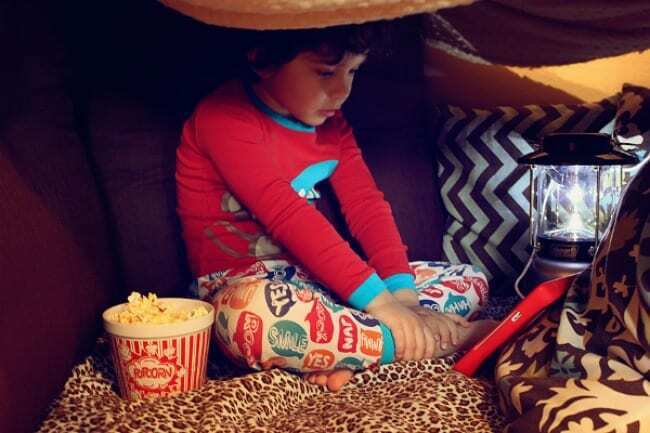 Thanks to Pop Secret for sponsoring today’s discussion – this article is courtesy of our writer Michelle…When I was a little girl, my brother and I would gather as many pillows and blankets we could find to build make-shift forts on rainy days. We often pretended to be soldiers, me usually being the “bad guy” and my older brother playing the hero. These are fond childhood memories that I cherish. So naturally, when my youngest son expressed interest in building his own fort, I jumped at the chance to recreate a piece of my childhood. But to my surprise his fort wasn’t going to be Fort Knox, instead my little man wanted a “man cave” of his very own. 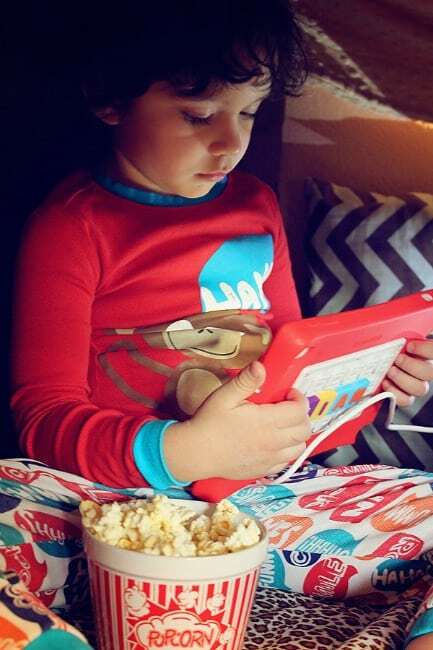 He wanted a little corner of the family room for him to retreat and eat his favorite Pop Secret popcorn while watching his favorite movies. 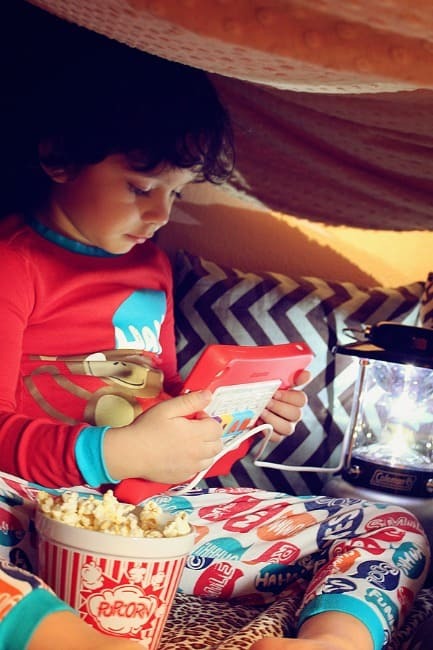 Stay tuned for a special challenge – Pop Secret wants to see your #PopSecretForts and you may just win a Pop Secret Surprise Pack! 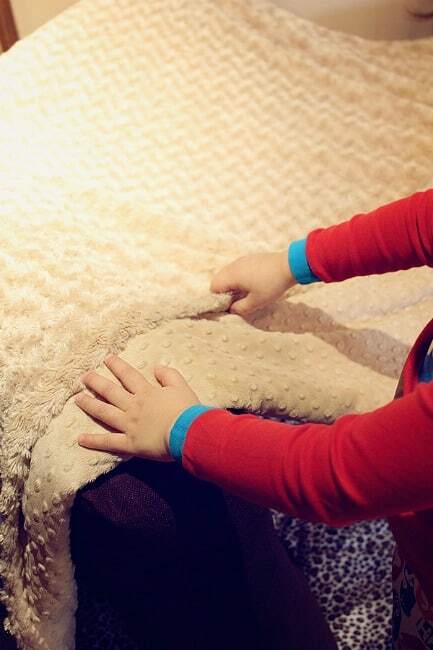 This is an awesome challenge that the kids will love helping with – don’t miss the free coupon! 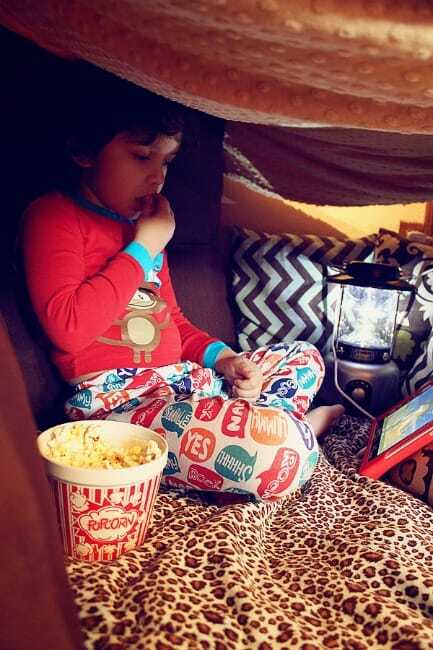 Here’s some fort building inspiration for you. So off we went to collect a bunch of throw pillows and blankets to construct his little man cave. We created pillow “walls” and a blanket “roof”, added a camping lantern for ambiance and lighting. Since you can’t watch a movie without popcorn, we popped a batch of Pop Secret Movie Theater Popcorn for him to snack on. Just like personalizing your own fort, you can personalize your snacks too! 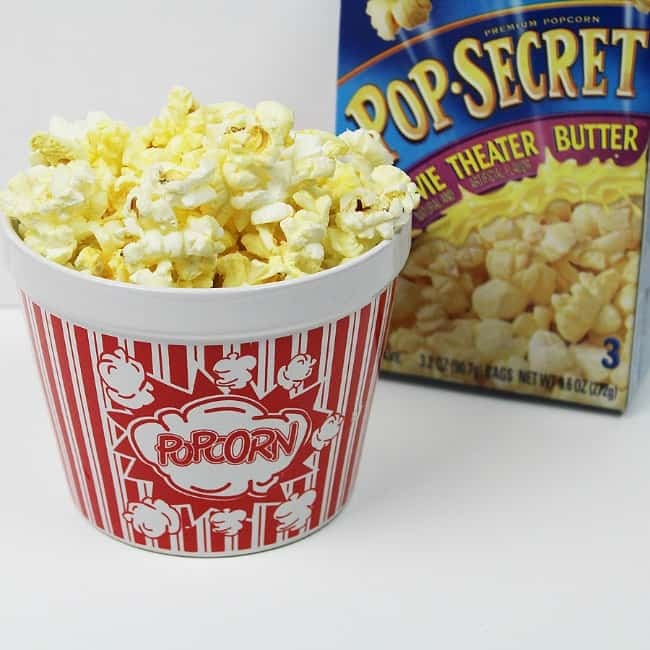 Choose from delicious Pop Secret microwavable popcorn flavors like Cheddar, Butter, Caramel, Extra Butter and more! Add in some chocolate coated candies and drizzled chocolate for a sweet treat. Craving a salty snack? Try making your own popcorn salt creation with spices in your pantry. 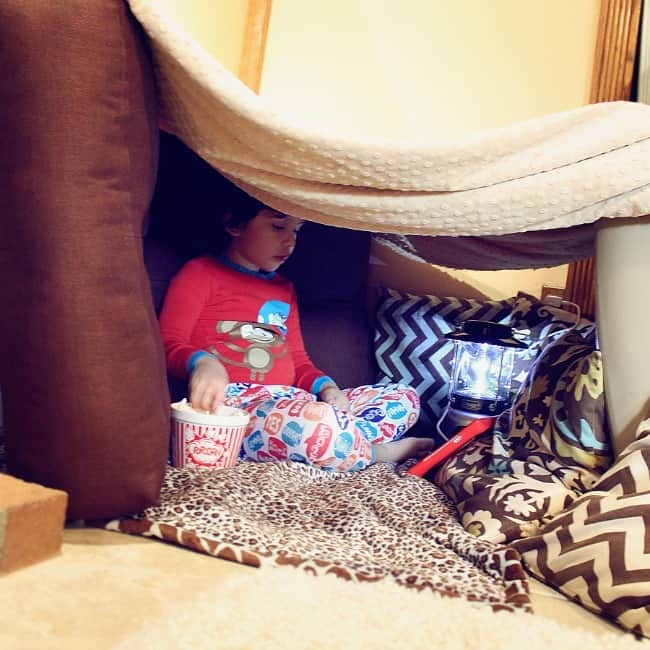 Looking to build your own Fort or “Kid Cave”? All you need are some pillows, blankets, chairs or sofa cushions for your structure. Add a little bit of lighting like a lantern or Christmas lights and for entertainment, your favorite movie or book. Don’t forget the Pop Secret popcorn and your favorite mix-ins and drink! To help you get started, Pop Secret is offering a $1 coupon on their Facebook page. Pop Secret knows that fun, like popcorn, is better when it’s shared. 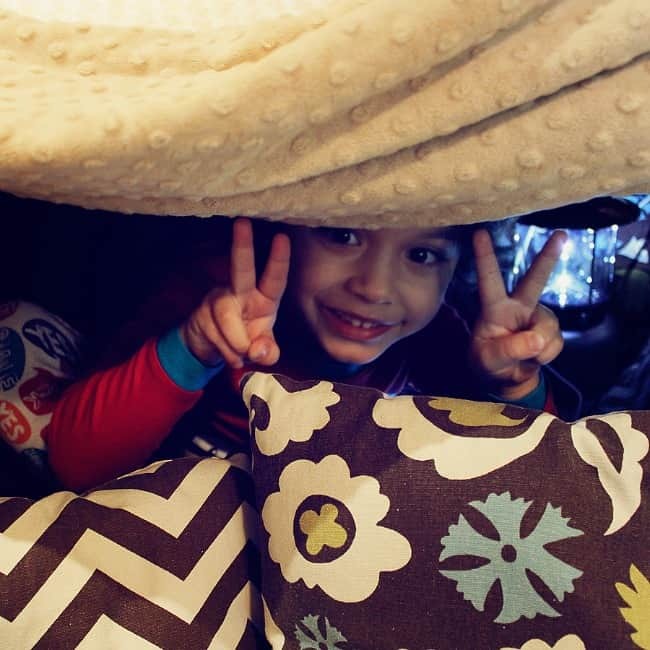 Send Pop Secret your pillow fort stories and pictures on Facebook. You can upload them right to the Pop Secret Facebook timeline and tag them #PopSecretForts. They might just share a little something back! Wonderful and fun idea! Loved building forts myself as a child lots of fun memories! Yes! Such a simple activity but so many great memories. Thank you, Layne! Fort building is always a popular activity around here.